IMPORTANT:iPrint 3.2 is only available as an online update to iPrint 3.0. 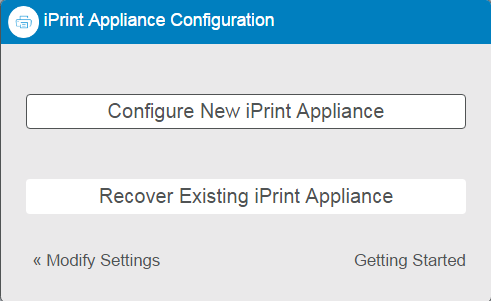 You can configure iPrint Appliance through the iPrint Appliance Management Console. You can configure new iPrint Appliance or recover an appliance from crash. To view help, click Getting Started. On a Web browser, use either the host name or the IP Address to access the Management Console. For example, https://10.0.0.1:9443. Ignore the security certificate warning, and continue to the iPrint Appliance Management Console. To avoid the security warning prompt every time you access the iPrint Appliance Management Console, you can add the certificate to the trusted certificates list on your browser. Specify vaadmin or root as the user name. Specify the password, then click Log in. The Management Console page is displayed. Click Configure New iPrint Applianceor Recover iPrint Appliance.